Yoqneam, Israel, July 27, 2017 MIND C.T.I. LTD. – (NasdaqGM:MNDO), a leading provider of convergent end-to-end prepaid/postpaid billing and customer care product based solutions for service providers as well as unified communications analytics and call accounting solutions for enterprises, today announced results for its second quarter ended June 30, 2017. The following will summarize our major achievements in the second quarter of 2017, as well as our business. Full financial results can be found in the Investor Information section of our website at www.mindcti.com/investor-information and in our Form 6-K. 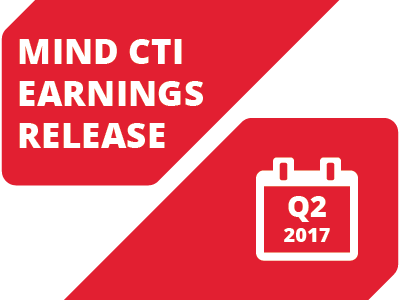 Revenues were $4.6 million, compared to $4.3 million in the second quarter of 2016, and compared to $4.5 million in the first quarter of 2017. Operating income was $1.2 million, or 27% of total revenues, compared to $1.0 million or 23% of total revenues in the second quarter of 2016, and compared to $0.9 million, or 21% of total revenues in the first quarter of 2017. Net income was $1.9 million, or $0.10 per share, compared to $1.0 million, or $0.05 per share in the second quarter of 2016, and compared to $0.9 million, or $0.05 per share in the first quarter of 2017. Net income includes a one-time net capital gain of $0.9 million. Cash flow from operating activities was negative $0.3 million, compared to positive $1.5 million in the second quarter of 2016, and compared to positive $0.5 million in the first quarter of 2017. Revenues were $9.0 million, compared to $8.9 million in the first six months of 2016. Operating income was $2.2 million, or 24% of total revenues, compared to $2.1 million or 24% of total revenues in the first six months of 2016. Net income was $2.8 million, or $0.14 per share, compared to $2.2 million, or $0.11 per share in the first six months of 2016. Net income includes a one-time net capital gain of $0.9 million. Cash flow from operating activities in the first six months of 2017 was $0.3 million, compared to $2.3 million in the first six months of 2016. As of June 30, 2017 we had 248 employees, compared with 295 as of June 30, 2016 and 250 as of March 31, 2017. As previously announced, in 2004 we bought land in order to build our own office building in Romania and invested 0.2 million Euros. The land was owned by our Romanian wholly-owned subsidiary, Dirot Comp SRL. Following the decision to sell the subsidiary that owned the land for 1.1 million Euros (around $1.2 million), we entered into a transaction that was concluded in the second quarter of 2017 and we recorded a net capital gain of $0.9 million. During the quarter we completed significant milestones in ongoing projects where revenue is recognized under the percentage-of-completion methodology but fees were collected upfront. In past years, we had encountered fluctuations in cash flows as well, since most new contracts and follow-on orders for enhanced functionality included a significant down payment. The negative cash flow from operating activities in the second quarter of 2017 is mainly due to the fact that we did not win any new customers since the third quarter of 2016, thus did not receive any significant upfront payments. Another factor is a change in our business model regarding enhancements for a major customer. We adopted the Agile methodology where we assign a dedicated team to such tasks and accordingly payments are received on a monthly basis, without any down payments. As previously mentioned, on a quarterly basis we incurred high fluctuation in taxes. In the first half of 2017 we paid advanced tax payments that included taxes on the one-time capital gain and estimated advanced taxes on income. Further to a change in Israeli tax regulations, we plan to apply for a significantly lower income tax rate, based on incentive plans approved in 2017 under the Encouragement of Capital Investments Law. We expect that, in case we obtain a tax pre-ruling that classifies us in Israel as a Preferred Technological Enterprise, our tax expenses will be significantly lower. There is no certainty that we will obtain such a ruling. Our cash position, including long-term available-for-sale securities, was $15.3 million as of June 30, 2017, compared to $15.4 million as of March 31, 2017. Revenues in the Americas represented 70%, revenues in Europe represented 20% and revenues in the rest of the world represented 10% of our total revenues. Revenues from customer care and billing software totaled $3.7 million, or 81% of total revenues, while revenues from enterprise call accounting software totaled $0.9 million, or 19% of total revenues. Revenues from licenses were $0.7 million, or 16% of total revenues, while revenues from maintenance and additional services were $3.9 million, or 84% of total revenues. Similar to all other quarters, our valued customers showed their appreciation for our technology and support. These valued customers continue to invest in upgrades to grow their businesses and improve processes resulting in follow-on orders. This quarter’s follow-on orders include one important upgrade to our latest Version 8, agreements to support enhancements related to deployment of LTE networks, support of Voice over LTE (VoLTE), support for EMV (credit card payments, cards with chip), mobile payments, IMS integration for billing and provisioning as well as specific customizations, additional professional services and maintenance renewals. A major follow-on order is for a transformation project of an existing customer that chose to migrate all services that were on a competitor’s system to our convergent platform. MINDBill’s truly convergent platform will support prepaid and postpaid business models, for wireless, wireline and broadband services. As mentioned, an important order is with a U.S. customer that will upgrade the existing solution to MIND’s Version 8 in order to benefit from the enhanced usability of our new Point-of-Sale module. This will be the second deployment of our new Version 8. As mentioned above, in addition to our offices in the United States, Romania and Israel, we decided to open a new subsidiary in Germany. Having a sales and support office in Germany enables us to better reach large local corporations and local carriers and better provide them the solutions for their needs. Large corporations invest in unified communications and require a high-end, scalable, unified communications analytics solution, call accounting and fraud detection tools. Our enterprise solution, PhonEX ONE, provides in-depth unified communication analytics, fraud detection and call accounting for organizations of all sizes, from small contact centers to multinational corporations. We will provide local support in German to our future local customers, ensuring that MIND delivers the best and most efficient services possible. As mentioned above, we increased our investment in marketing in the first half of 2017. We participated in 11 conferences, much more than in the past, including MWC in Barcelona, Cisco Connect in Nairobi, CommunicAsia in Singapore, Cisco Live in Berlin and Microsoft Inspire in Washington DC. Participation at conferences enables us to expand our exposure and to meet our customers and partners. In addition, we receive valuable feedback, understand their needs and learn their future directions.